"There is a girl in my church (or a group of girls) who wear totally inappropriate clothes to church. What do I say to her?" Here's my response . . .
For those of us who have grown up in the church, the choices of non-Christians can often be alarming. But we need to stop being surprised when the lost act lost. It's been my consistent experience that young women usually don't dress immodestly because they want to ooze sexuality but simply because they don't understand God's heart on the issue. Instead of passing down a list of rules for what we wear, the Bible encourages us to "wear" the qualities of Christ. Let's take a detour to a story that might help us see how to approach that young lady in your church like Jesus would. In John 8, Jesus encountered a woman whose life was riddled with sexual sin, and she probably looked like it. She had been "caught in the act" of adultery after all. I doubt she had time to throw on modest clothing before she was dragged before Jesus. How does Jesus handle the issue? First, He deals with the hearts of her accusers. "Let him who is without sin among you be the first to throw a stone at her" (v.7). Maybe you don't come in to church wearing a spaghetti-strap top and way-too-short skirt, but did you bring anger, bitterness, resentment, or addiction? Immodesty is an easy-to-spot sin, but don't come at that girl with judgment or frustration. Wait to approach her until you can do so in love. Jesus: "Has no one condemned you?" Jesus: "Neither do I condemn you; go, and from now on sin no more" (vv. 10–11). This is the simple, beautiful message of the gospel. There's no doubt we are all guilty of sin. We can't cover it up or talk our way out of it. The adulterous woman deserved the punishment the crowd wanted to give her. She was guilty. I deserve the punishment of death that is suitable for sinners. I am guilty. But Jesus offers the woman an exchange. Trade in condemnation for acceptance. Trade in shame for love. Trade in a life of sin to become a new creation. Does that girl in the pew in front of you know the gospel? Has she turned her life over to Him? Just because she is in church doesn't mean she has. When you approach her, start with the gospel. Long ago, I was a high school history teacher. Maybe that's why my love for young women is so deep. I believe with my whole heart that middle school and high school girls can change the world. Back in my teacher days, I had a saying the affected every lesson plan I wrote, "Whoever is doing the work is doing the learning." Sure, you could download your thoughts on modesty to the young women in your world. They might think it matters. They probably won't. But if you challenge them to open up the Bible for themselves and to discover God's heart on this issue (or any issue) without an agenda, you will see them begin to understand. This requires an important shift. We need to stop asking, "How can we get our girls to dress modestly?" and start asking, "How can we get our girls to be passionate students of God's Word?" Hebrews 4:12 tells us that God's Word works like a sword, surgically removing those parts of our hearts that don't line up with the holiness of God. Which would you prefer? A girl who covers up out of obligation, or a girl who chooses to change because of God's work in her through His Word? Let me write your curriculum! Here are some key verses and thoughts to get you and the girls in your church started. "Likewise also that women should adorn themselves in respectable apparel, with modesty and self-control, not with braided hair and gold or pearls or costly attire, but with what is proper for women who profess godliness—with good works" (1 Tim. 2:9–10). This is a passage about what it should look like to be a woman of faith, but it is not a dress code. There's no hem length mentioned here—no black and white rules about sleeves or no sleeves or the exact right place for a Christian woman's neckline. In fact, this verse is less about the clothing we wear and more about God's intention that we clothe ourselves with qualities that reflect Him. Notice that right after Paul tells Timothy that women should dress modestly and avoid appearances designed to draw attention, he makes it clear what all women of faith should wear—"self-control" and "good works." Obviously, those aren't things that hang in my closet. 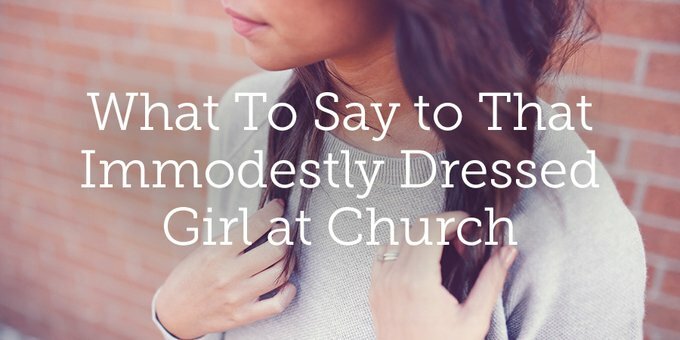 When we talk to girls about the issue of modesty, we need to broaden the conversation to get them thinking about how the ways they present themselves reflect (or don't reflect) Christ. Matthew 6:28–30 tells us not to be preoccupied with clothes, but instead to focus on the things of God. 1 Corinthians 6:19–20 says our bodies are a temple of the Holy Spirit. Therefore, we are to honor God with our bodies. 1 Peter 3:3–4 says that true beauty is internal. Nothing we could ever put on and nothing we could ever take off can give us the kind of true, lasting beauty that comes from Christ working in us. 1 Peter 5:5–6 urges us to clothe ourselves with humility. Proverbs 31:25 describes a woman who is clothed in strength and dignity. Psalm 132:9 talks about being clothed in righteousness. Instead of passing down a list of rules for what we wear, the Bible encourages us to "wear" the qualities of Christ. This is why you have to start with the gospel when approaching this issue. No one can wear the qualities of Christ until they have turned their lives over to Him. I'm not sure if you've ventured into a teenage clothing store in the mall lately, but being a young woman with a commitment to modesty and purity isn't easy. Marketers aren't pushing girls toward the "respectable apparel" that Paul mentioned in 1 Timothy but toward the opposite. If the girls in your church are going to live like Christ has called them to in this area, they are going to need reinforcements. Care for her heart, first, through love and Bible study, but then help her give teeth to what she's learning by venturing with her into the mall with ideas and encouragement. Yes, modesty matters! But the hearts of the young women in your world matter so much more. Can you swap the adulterous woman found in the story in John 8 with a girl in your world? If so, will you ask the Lord to help you respond to her like He would by sharing the gospel in love?